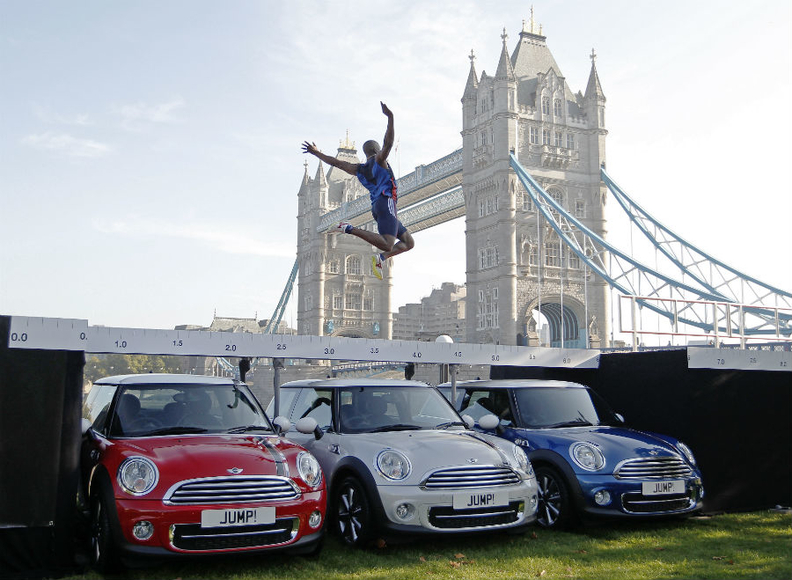 British long jumper J.J. Jegede jumps over three Mini cars, next to Tower Bridge, during an event to promote the brand in London. FRANKFURT (Bloomberg) -- BMW is featuring Mini in its sponsorship of the Olympics as part of a bid to polish the brand's sporty image and defend its profit from mounting competition. More than 200 vehicles from Mini, which made a cameo appearance at the opening ceremony in London, are ferrying around athletes, while a special-edition Mini has been released, which features the logo of the 2012 Summer Games on the roof. With competition in the compact segment intensifying, Mini has also launched a new John Cooper Works GP version, billed as the brand's fastest car ever. "Mini is the benchmark in profitability in the small-car segment," said Albrecht Denninghoff, a Frankfurt-based analyst with Silvia Quandt Research. Mini is a big part of BMW's strategy to fend off Daimler AG's Mercedes-Benz and Volkswagen AG's Audi, which are both targeting the top spot in premium-auto sales. The brand, reintroduced in 2001 after BMW's failed takeover of Rover, also wins new customers to the group and adds roughly 200 million euros ($243 million) to annual profit, according to an estimate from Juergen Pieper, an analyst with Bankhaus Metzler. Other carmakers are taking aim at the upscale small-car segment. Fiat started production of a wagon version of the 500 this year, adding to the retro-styled compact's lineup to bolster its challenge to Mini. The 500L is one of the Italian manufacturer's few new models as it cuts spending to conserve cash amid a market slump in Europe. PSA/Peugeot-Citroen, which currently supplies engines for the Mini, has expanded its DS line, introducing the DS3 compact in March 2010 to win sales from Mini. Mercedes plans to increase its small-car lineup to at least five models from two, and Daimler's Smart city-car brand is developing a new four-seat model with Renault. Premium carmaker Audi has expanded the A1 subcompact with a four-door version and is adding special high-end editions. Mini is responding to the competition by expanding. The new Paceman two-door crossover will arrive in showrooms early next year, marking the brand's seventh model in a lineup that spans a two-seat roadster, a wagon and the classic hatchback. Mini, which helps BMW lower the average emissions of its vehicles to meet tighter environmental regulations, will be integrated more closely with other models. The manufacturer plans to use the same technology to underpin BMW cars when a new version of the hatchback is introduced in 2014. BMW also may start using its own engines in the brand's vehicles after an agreement with PSA expires in 2016, CEO Norbert Reithofer said last week. "Mini's profitability will improve when the brand starts sharing the same small-car platform with a new line of BMW vehicles," said Jose Asumendi, an analyst with Baader Bank based in Unterschleissheim, Germany. "The small and compact car segment is a territory in which the luxury carmakers compete with volume manufacturers. From a marketing perspective, the Olympic sponsoring is a great tool." As part of the Olympic activities, 200 Mini Countryman crossovers and 40 electric-powered Mini E models will help BMW's fleet of vehicles pull boats, serve as mobile camera platforms and carry medal winners to media interviews. Three so-called Mini Minis, radio-controlled scale models of the hatchback, will shuttle javelins, discuses and shots during track and field competitions. The London 2012 edition features the London skyline etched across the dashboard and a sport stripe in the style of the UK flag. It starts at 17,980 pounds in the UK ($27,920), 51 percent more than the base version. "Sportiness is an important part of the brand image," said Michelle Roberts, spokeswoman for the carmaker's Olympic activities. "Sporty driving dynamics and agile handling are the cornerstones of the Mini product family." BMW declined to comment on how much it paid for its Olympic sponsorship. Part of the sporty push is Mini's John Cooper Works badge, named after the engineer who started tuning Minis in the 1960s for use in rally races. The hatchback version starts at 22,455 pounds in the UK, 89 percent above the base model. The sport-tuned line accounted for 1.7 percent of Minis sold last year, beating the 1.4 percent share of BMW's M performance models and AMG's 1.5 percent share of Mercedes sales. The Daimler luxury brand's compact-car push will include an AMG variant of the A-class hatchback. The top Mini is the new John Cooper Works GP version, which will probably outgun the 211-hp engine in current performance models, more than double power of the base model. The limited-edition GP features a special twin-scroll turbo engine, adjustable race suspension and a roof spoiler. Honing its image and expanding to at least 10 model lines should help Mini continue to grow. Sales are forecast to increase 30 percent to 370,300 vehicles by 2020 from 285,060 last year, according to IHS Automotive. BMW is discussing producing Mini vehicles at NedCar, the former Mitsubishi factory in the Netherlands, as the Oxford, England, assembly plant nears its production limit.